Celebrate the start of our local growing season this spring with the arrival of asparagus! 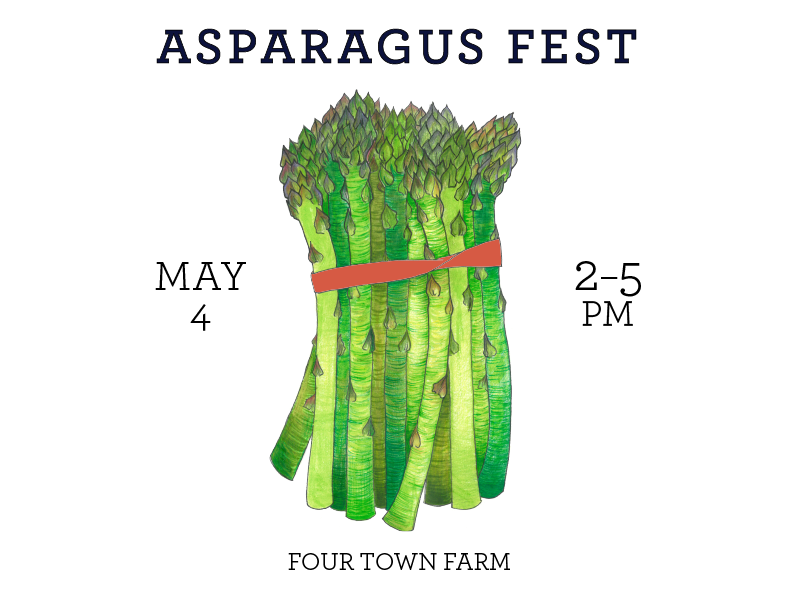 Join us on a very special tour of the asparagus fields at Four Town Farm — and pick your own pound to bring home! We’ll enjoy local wine & beer, and a wide array of delectable asparagus dishes created by talented chef-instructors from Johnson & Wales University, College of Culinary Arts. On the tour, we’ll learn how asparagus is propagated, grown, and maintained on this 150-acre fifth-generation family-run farm — located where the four towns of East Providence, Barrington, Seekonk, and Swansea meet. After the tractor-pulled farmer tour through Four Town Farm’s asparagus fields, we’ll return to the gorgeous farm stand for music and refreshments. This event is a fundraiser. All proceeds will support Farm Fresh Rhode Island, a 501c3 nonprofit organization growing a local food system that values the environment, health, and quality of life of the farmers and eaters in our region. Much thanks to Four Town Farm for generously donating their farm stand, fields, expertise, and delicious asparagus for this event. Thank you to Johnson & Wales University for their ongoing support, the use of equipment, and for the time and skills donated by their excellent Chef-Instructors! The beautiful asparagus illustration used in our Asparagus Fest promotional materials was created by our very own Taylor Jones. We love it!